More than 200 bushmen from the Kalahari desert are taking the Botswana government to court over their forced eviction from ancestral land. They are challenging a 2002 decision to resettle them outside the Central Kalahari Game Reserve, which was their home for tens of thousands of years. Activists say Monday's action could be a test case for the rights of bushmen across southern Africa. Almost 200 bushmen have returned to the reserves despite the resettlement. 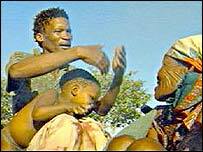 The government says the resettlement has been good for the bushmen, providing them with the benefits of the modern world. But the British newspaper, the Sunday Telegraph, reports that while the authorities have tried to highlight the benefits of the programme most of the resettled people were living on state rations in a village stricken by unemployment, alcoholism and sexual crimes. The UK-based group Survival International, which has supported the bushmen's case, says the indigenous people were driven out to make way for diamond mining. Botswana's highest court is hearing the case in New Xade, a purpose-built settlement for the bushmen in a remote desert enclave. It will begin with an "inspection in loco" of the resettlement centres and communities in the game reserve to which bushmen have returned. Mathambo Ngakaeja, co-ordinator of the Botswana chapter of the Working Group on Indigenous Minorities in Southern Africa, said his people were determined to stay on their ancestral land. "The government has trampled on our land, and terminating basic and essential services is tantamount to forced evictions," he told AFP news agency. "We seek the courts to declare that those who had been effectively forced to move due to the termination of services, should be returned to the CKGR." Botswana President Festus Mogae has dismissed the demands as "nonsense", saying that the bushmen's nomadic way of life was a "vestige of the past". The bushmen took the case to court two years ago but it was dismissed on a technicality. Last month they won the right to have their case heard again. "The traditional bushmen way of life has gone for good"